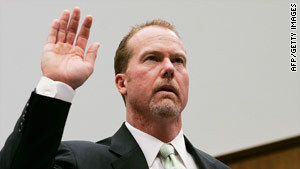 Soon after he raised his right hand and testified before Congress at a hearing on baseball and steroids in 2005, McGwire said, "I'm not here to talk about the past" -- probably his most public and famous denial in a decade of them. Last October, the St. Louis Cardinals hired McGwire as a hitting coach, and spring training begins next month. So Monday, during an interview with the MLB Network, the 12-time all-star felt it was time to come clean. He admitted to using steroids and human growth hormone for most of his professional career. McGwire said his actions were foolish, a mistake. He said he started before the 1990 season. He was still using them in 1998, when he broke the record of Yankee Roger Maris with 70 single-season home runs. McGwire told MLB the Maris family has every right to count Maris' 61 home runs in 1961 as the official record and that he called Pat Maris, the widow of Roger Maris. The reluctant hero, who ensured that the diary of Anne Frank did not fall into the hands of Nazis after the 14-year-old's arrest, has died. She was 100. Gies was among a group of Dutch citizens who hid the Frank family of four and four other people in a secret annex in Amsterdam, Netherlands, during World War II, according to her official Web site, which announced her death Monday. The family stayed in the secret room from July 1942 until August 4, 1944, when they were arrested by Gestapo and Dutch police after being betrayed by an informant. When Gies and a friend were left behind, she picked up Anne's papers from the floor, kept them in a desk drawer and gave them to Anne's father, Otto, after the war. Anne died in a concentration camp in 1945. Her father published her diary, titled "The Secret Annex," in 1947. It was released in America in 1952. Despite the extreme hardship she endured during the German occupation, Gies never embraced the label of a hero. "More than 20,000 Dutch people helped to hide Jews and others in need of hiding during those years. I willingly did what I could to help. My husband did as well. It was not enough," she says in the prologue to her memoirs, "Anne Frank Remembered: The Story of the Woman Who Helped to Hide the Frank Family." In her diary, Anne Frank wrote, "In spite of everything I still believe that people are really good at heart. I simply can't build up my hopes on a foundation consisting of confusion, misery and death." The 25-year-old, who suffers from muscular dystrophy, moved to California in 2008 from Oradell, New Jersey, to have access to legal medical marijuana. Oliveri told NorthJersey.com that he uses about a quarter pound of marijuana a month to deal with the pain in his legs and back. "I took every medication known to man before I took weed," said Oliveri. "I knew it was a risk ... but it was a life-or-death matter." Oliveri was back in New Jersey Monday when the legislature voted to make that state the 14th in the country to approve marijuana for medicinal use, pending the governor's signature. Gov. Jon Corzine, who leaves office next week, has said he would sign the bill. According to the news release from the state Senate, the bill would allow doctors to give to patients with state-issued identification cards prescriptions to buy marijuana legally from registered alternative treatment centers. Today, Transportation Secretary Ray LaHood will be joined by National Safety Council President Janet Froetscher and advocate Jennifer Smith for what they describe as a major announcement about future efforts to stop distracted driving. The U.S. Department of Education sent Smith's story to CNN's Intriguing List: "On Sept. 3, 2008, after receiving a phone call offering food for the feral cats she rescued and nurtured, my mom left her home in Oklahoma City. She was driving through an intersection when a young man ran a red light and T-boned her car at 45-50 mph, which was the posted speed limit. Mom died within a couple of hours from blunt force trauma to the head, neck and chest. The young man was a sober, churchgoing 20-year-old who had never even had a speeding ticket. Visibility on the day of the crash was excellent. "The cause of the crash was a tiny device that fits in your pocket: a cell phone. He was on his phone for less than a minute. People don't realize it takes just seconds of not paying attention for a life to be taken away forever. When the trooper asked the driver who caused the crash what color the traffic light had been, the distraught young man responded that he never saw it. The absence of skid marks at the scene indicates he never tried to stop. Our lives will never be the same because of that crash and the loss of my mom." The longtime "American Idol" judge said he'll be leaving the popular Fox talent show at the end of the season, the network announced yesterday at the Television Critics Association press tour in Pasadena, California. Cowell's popular UK talent show, "The X Factor," will be coming to the U.S. in the fall of 2011, according to Fox. The acerbic critic will be both executive producer and judge on "The X Factor." Speculation has raged for weeks as to Cowell's future. Though he's well paid for his "Idol" work -- an estimated $36 million per season -- he has expressed a desire to focus on "The X Factor." "[I] didn't think it was right to do two shows in America at the same time, so [I] decided to leave one and start another," he said. He also said he missed Paula Abdul, the former "Idol" judge who left the show in August, but wouldn't confirm or deny whether she would appear on "X Factor" in the U.S. Cowell and Abdul had a good-naturedly contentious relationship on "Idol," with the tough-minded Brit often acting as bad cop to the "Forever Your Girl" singer's good cop. Ellen DeGeneres, who's taking over Abdul's judging slot, joked about Cowell's announcement on her talk show Monday. "So this just happened, Simon Cowell just announced that he's leaving 'Idol.' This will be his last season. He announced he's leaving on my first day. I'm trying not to take it personally," she said.